ANY hoo. Coffee candy. Reminds me of Bubba and that’s good. 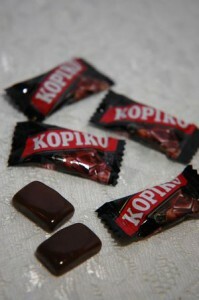 Although, I never really liked coffee candy when I was younger and I ain’t going out of my way now. Even though I love coffee. I drink a big cup every morning and I’m addicted and I like being addicted even if the cortisol in it makes me fat. And I love coffee ice cream and coffee drinks and all that. But still. Coffee candy? eh. And then Sandy at work dropped three little pieces of Kopiko on my desk. Perhaps it’s Turkish? Or Arabic? Wait. Can something be Arabic? Or is just the language that’s Arabic…well whatever it is, I like it. These taste like strong, sweet coffee, but not too sweet. They are really hard – like obsidian with a similar sheen. No gummis these. But again, a real genuine coffee taste. And dare I say filled with caffeine? Cuz seriously, I’m high right now. And I can’t stop writing. If you have anything you need me to write or do or say on paper then send it on over right now cuz I can’t, nay I WOn’t stop I’m just gonna keep going yeah baby! Get these. Throw them on a candy dish. Keep the kids away, but invite your friends over to play Scrabble and live it up like Bubba. Only a 6, Matt? I’m disappointed..jk 🙂 These candies have saved me from falling asleep in bad traffic driving back to East Bay from San Jose. A very good late afternoon slump buster. Cheap too. Really cool blog ! I loved reading it. I lovvvvve these! There from thailand! By the way they’ve released a new cappucino flavored ones in recent yrs.also taste fantastic (much higher than a 6 lolz) ! if u need some samples for review i can send them to u. I live in thailand 🙂 love ur site. Keep up the great reviews! Whoah, thanks for the heads up! Yup…Kopiko is the best instant coffee treat ever..
Kopiko has always been my coffee candy to go when I don’t have the change to drink a hot cup of coffee or if miss a Starbucks date. I always make sure I got a handful of coffee candies in my bag. Love this coffee candy! Has been my favourite candy in the last… maybe ten years, or more! They are quite popular on sweet & candy shops here in Spain and often offered in bulk. PD: They are from Indonesia! (there is Arabic since it’s the second country with Muslims on it!) And it’s also the reason that has this unique “Java coffee” flavour in it.